Just to the northeast of Britain and West of Vesper. History: The Free City of Oasis is located in the desert surrounding the Shrine of Compassion and is a free standing area with no government, hence the name Free City. The buildings in the city are owned by a lot of different people and guilds and still the citizens manage to work and play nice with each other. While in Oasis there is a single rule which was created to attempt to insure that all people of Sonoma could enjoy themselves and come together. Here is an excerpt I found somewhere written by a person who was originally involved with the founding of Oasis: Oasis from its inception has always been a free city. Not free for all killing, looting, stealing, but free from the tyranny of Lord British and his laws. We were a self governed, self guarded and self sustaining city that welcomed ALL with open arms. 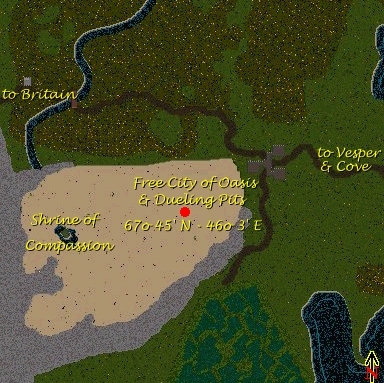 Thieves, murderers, beggars, nobles, Dread Lords, and Virtuous people all resided side by side in the city of the sands. They all lived following the one rule of Oasis: Do not steal, kill, loot, any red, gray, or blue, while within the limits of the city. 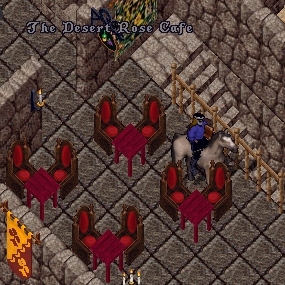 The Oasis Castle, which is haunted they say, has The Desert Rose Cafe in the center of the castle itself, on the second floor. It seats about sixteen to twenty people easily, and there’s even a flowered dance floor where people can dance with that special someone, barefoot of course. The castle has a newly installed rooftop temple that is available for wedding and other small events. To enquire about using the using the temple and cafe for your wedding, reception, party, or event, you can ICQ Pluffina at 4211591. 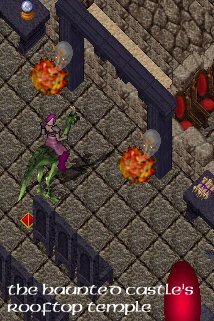 Other buildings are The Oasis Inn, The Rusty Anvil Tavern, Lurker’s Library, Oasis Tavern, and the Dueling Pits for sponsored fighting events. Oasis Tavern is a large tower on the edge of the sands, owned by Lord Minaurus of OAS. Lord Minaurus has been instrumental in keeping the town alive and is leading the current drive to revitalize and repopulate Oasis. If you own a house in Oasis and wish to be part of the town, please contact Lord Minaurus at ICQ#12476094. 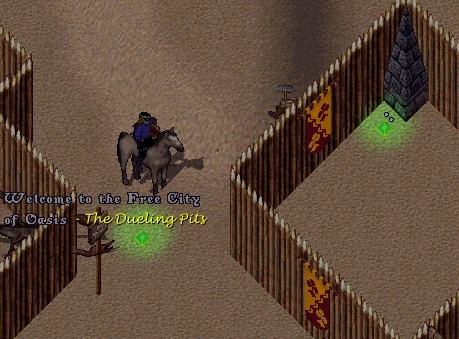 “I plan to add people to OAS guild that either live in Oasis and want people to know it by their guild title or people who want to volunteer with Oasis activities as either a city guard, referee in the arenas, or even a city official” The Dueling Pits consist of a Pit House, three small fighting pens and a grand arena for finals. Vincent Debrow is the owner of the Oasis Dueling Pits. Vincent is trying to stick to the guidelines set in place by the city’s founders and by smitten w love, the original owner of the pits. The Oasis Fight Night takes place during short, random “seasons.” There are 2 – 3 seasons in a year,and each season lasts from 12-15 weeks, depending on the time of year. At the end of the season, all champions are invited back for the Final Fight Off. Oasis Fight Night Rules: THIS IS THE MOST IMPORTANT RULE OF THE OASIS FIGHT NIGHTS!! This event is run by people who want to show all people of Sonoma a good time and who like to see good PvP. For this reason, when you are in Oasis for the Fight Night Event, we ask that there is no Noto-Killing, Order/Chaos or Faction fighting. We’re here to see good PvP and we aren’t concerned with your guild, your color or your faction. We’d like to have an environment where even Red characters can come out and participate in a PvP contest without fear of getting attacked simply because they are red. So please, park all of that at the login screen when you come out for this event. If you do not abide by the rules than the rules cannot protect you. If you wish to compete, show up when the event is scheduled. You can watch the Sonoma Stratics News to find out when the new season will begin. The rules are simple and will be explained you before you enter the pit. The tournament is single elimination and the top three fighters receive a prize. The first place winner also gets a pass to the Final Fight Off at the end of the season. Once in the pit, the judge will give a quick run down of the rules to avoid confusion. He will then ask the players to flag on him, turning them gray. This is for the safety of the competitors, to insure that murder counts will not be given. In addition If a murder count is given out or if anyone attacks an Oasis staff member they will be barred from competing in future events held in the Oasis Pits. There will be no time limit for the matches. However, at the five minute mark, the judge will declare ‘No Healing’. At this point, the participants may no longer heal damage by any means. All other spells and potions may still be used. Bandages that were started before the ‘No Healing’ call are allowed to resolve. However, if a bandage heals damage more than 14 seconds after the ‘No Healing’ call, that person will be disqualified. If a participant can steal, he may utilize that skill against his opponent. At the end of the match, the thief will return any items stolen from his or her opponent. If the thief wins the match and wishes to be killed to get rid of his ‘perma-grey’ status, an official in the pit will do the deed. During the match, mages may not cast Earthquake, Meteor Swarm, or Chain Lightning. – note – Blade Spirit and Energy Vortex spells may be used however if they target one of the arena judges they will be dispelled. No magical weapons armor, or items may be used. Participants may not “Buff” themselves up before the match begins through the use of spells, potions, or items. Fencers and swordsman may use any grade of poison on their blades. Mages may cast the Poison spell without limitation. No pets may be taken into the pits. This includes all tamable monsters and mounts, even ethereal mounts. Sometimes a special merit award will be given out. These will remain undisclosed to prevent people from “throwing” a fight or dragging it out to receive one of these prizes that are based on performance and not if you win or lose.